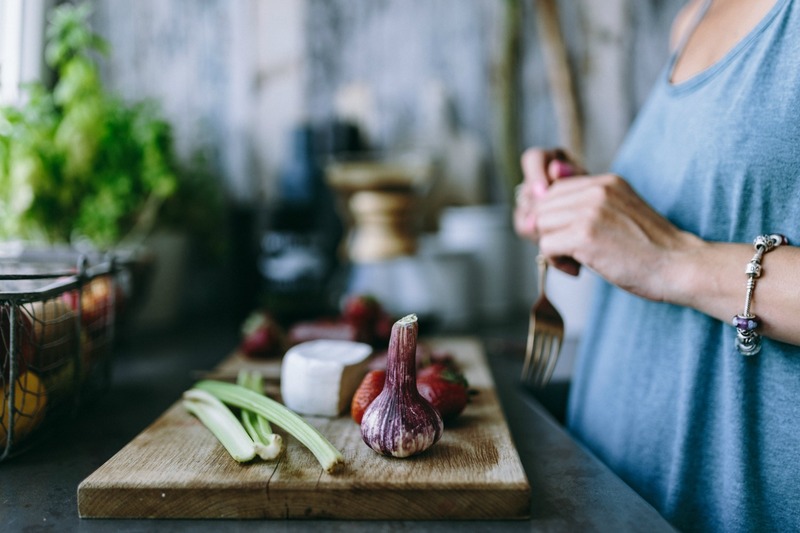 If you want a farmhouse inspired kitchen then check out these 7 INEXPENSIVE tips to help give your kitchen a farmhouse feel! Have you always loved the look of a farmhouse inspired kitchen but aren’t ready to rip out your old (or new) cabinets and countertops? There is a way to add a few inexpensive elements that can give you the feel you want! Most of these don’t require any work, and the ones that do, are simple DIY projects. Adding some of these touches is a great way to give you the farmhouse kitchen you want without breaking the bank! These farmhouse kitchen ideas on a budget are so simple to implement! 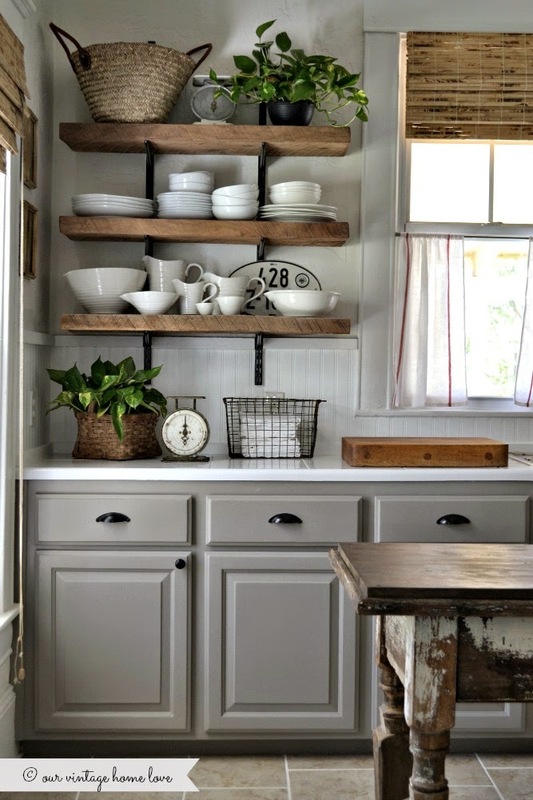 Open shelving is a great way to add some farmhouse charm. They are fairly simple to install and one of the biggest bangs for your buck when it comes to storage. All you need is a level, a few brackets, a piece of wood, and a stud finder. 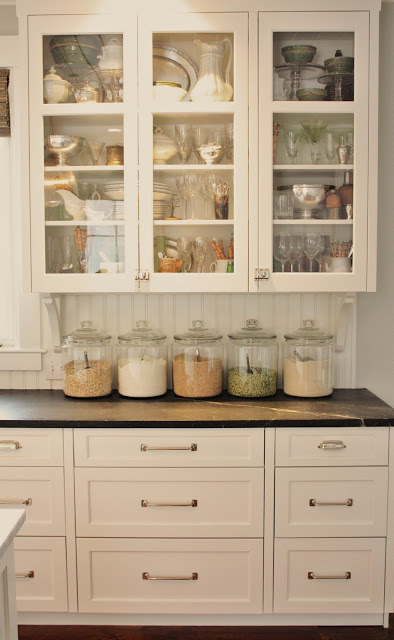 An even easier option would be to just take the doors off of your existing upper cabinets! Wire baskets are great for storage. They can hold anything from linens to veggies. Add them to your open shelves for easy access to your everyday items. 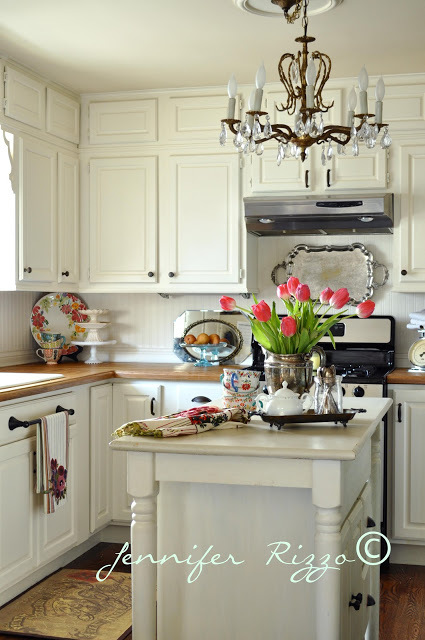 Beadboard is an inexpensive material that can add instant charm. You can use it as a backsplash, face the sides of an island or put it up on a wall to add texture. Butcher blocks, cutting boards and wooden utensils can add the warm tones you need for a farmhouse feel. Display your utilitarian objects to warm up the space. 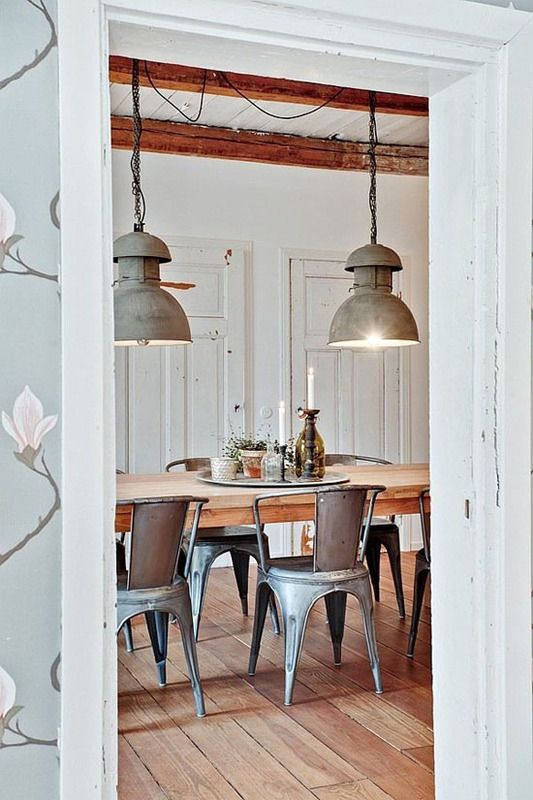 I personally love a little touch of metal to a farmhouse kitchen. 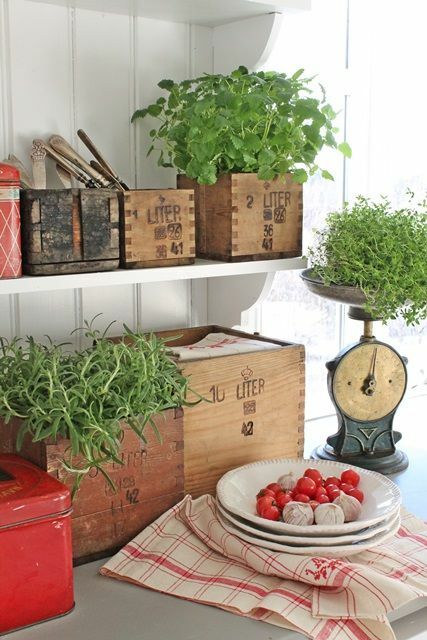 Galvanized pots for herbs or silverware are a simple and easy way to add a metal accent. Other ways would be to incorporate metal seating or lighting. What would you add to this list?!?! AND for great decor ideas, check out my HOME DECOR TIPS section. Do you need some help getting started? Get my FREE Mini Project Planner below! Great ideas! I have a long shelf above my cabinets where I put old blue canning jars with lids and added an inexpensive rope light behind them. The light gives a warm blue glow to the kitchen at night. I also put my large utensils in an old white crock on the counter. I LOVE blue canning jars…I can’t believe I left that one off the list!! This may be obvious, but put in glass cabinet doors. Is that expensive to change? It was in a lot of the pictures. Or maybe that doesn’t count as farmhouse? Also, paint your cabinets white. 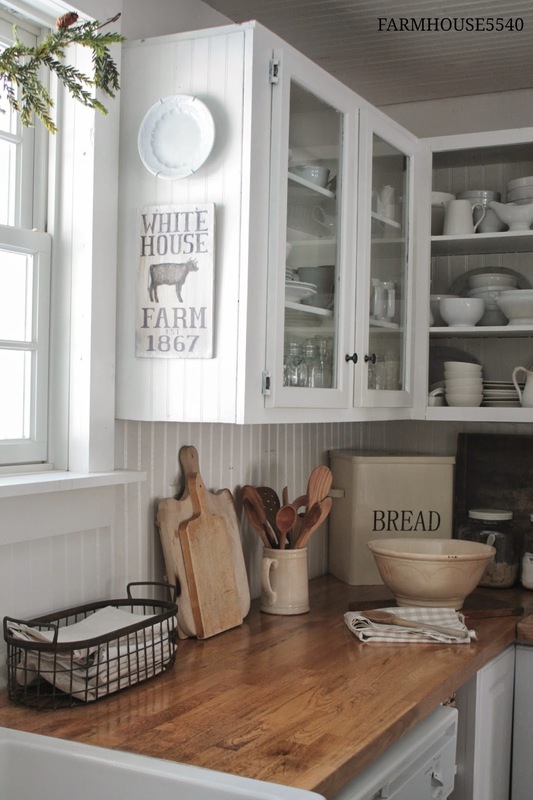 Most of the farmhouse kitchens we’ve seen online are white. Ikea has a cheap apron sink. So maybe that’s getting more expensive to replace your sink with apron, but that says farm house as well, I think. Perhaps changing the drawer pulls? We plan to use the black cup pulls from Ikea when we change our kitchen. Those black pulls (or nickel) on the white cabinets look awesome. I’ve seen that in a lot of farmhouse kitchens. Me encantan todas las ideas! Los estantes mañana mismo trato de ponerlos en pràctica y despuès les comento! I love the beadboard idea and have wanted to install this as a backsplash only on one wall of my kitchen behind the sink. Cutting circles out for a wall mounted faucet and wall affixed over-the-sink task light is a bit daunting for me. I am a widow and have no ‘handy hubby’ to help me with this. Since our kitchen cabinets have recently been painted white, I’m also afraid the white beadboard would be glaring and bland. Any suggestions? As an alternative to wood bead board, paint-able bead board wall paper is available. Sharon, yes a great tip! Thanks for the suggestion! What is the color of gray on the kitchen cabinets as seen from the pictures above? Beautiful post! Thanks you so much.I never thought of it as farmhouse style ( I grew up in Brooklyn! ), but I am so in love ..I will follow your farmhouse board. Thanks for the post. Wow! Love this. Great ideas! I’m absolutely in love with the chairs in the last picture. It appears like they are galvanized chairs with some rust. Could you tell me where you purchased those? We’re in the process of renovating an old farmhouse and we’ll be using the reclaimed lumber from other parts of the house for open shelving. I’ve been picking up decorative cast iron brackets any time I see them and will use those to hold the shelves. Amy, that sounds awesome!!! I would love to see the final results! I’d add pottery. A stoneware bowl of fruit or a stoneware pitcher with flowers. Deborah, YES! I love stoneware and it would definitely give a farmhouse feel. What type of black countertops are those? My guess would be soapstone, which, I believe, was a material often used for countertops once they began building them. This is another situation where there are so many things I love in this post, until I don’t know what to say I like most, because I love everything you did here. Thanks for sharing. I liked the idea of installing a beadboard backsplash. Though it’s expensive, it can certainly give your kitchen the ultimate charm. 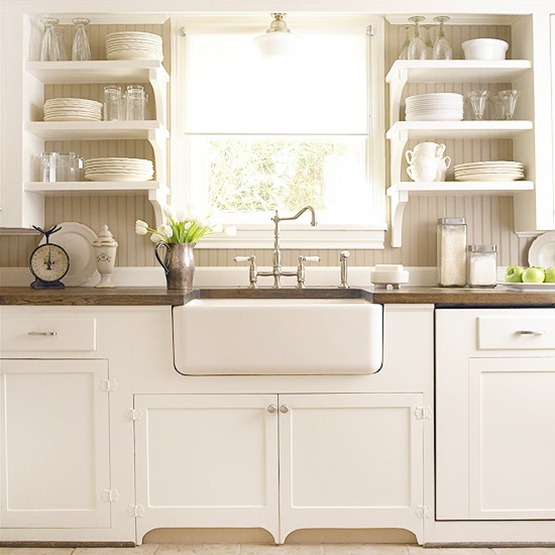 Farmhouse inspired kitchen are now in the demand as it looks trendy. It could also be called as the timeless kitchen. Kitchen remodeling can be stressful for the homeowners who have little time to spend and absolute no knowledge about it. I would suggest them to hire a professional home renovating contractor who have years of experience and skills in accomplishing renovation works. We just installed beadboard in our kitchen remodel!! Not as a backsplash but I love the idea!! Beadboard is a great way to add character without breaking the bank!! Mary asked about the black countertops. In the picture with the glass canisters, it looks like soapstone. We are starting our new home next month and are using soapstone from a nearby Virginia quarry with white cabinets. It’s a classic! Bonnie, I LOVE soapstone!! Great choice! what color are the cabinets (gray with black handle)? I am so thankful for what you have shared about these brilliant ideas for a farmhouse inspired kitchen. My sister and I decided to make a kitchen renovation. Aside from that, we also planned on buying new kitchen decorations for a change. Maybe a sort of almost same design or style. I am going to show her this post once she arrives.